It’s been a while, but we’re so taken with our friends in the north that we’ve decided it’s high time for another northern Gold Coast revisit. While we’ve included a few tried and tested haunts that would be rude not to mention, a few other snazzy establishments have also been brought to our attention in the interim and are simply begging for some attention. So folks, take our lead and treat yourself to these atmospheric and oh-so-inviting northern Gold Coast exposures. The moment you walk through the door of this bustling, tucked away diner in the northern suburbs you are greeted by a host of warm smiles, the hum of relaxing tunes, and the splendid sight of some incredible homemade sweet treats. Terrarium’s menu consists of classic fresh and organic choices, with standouts including a delectable halloumi stack or, our fave, the warm house-made hummus salad with rocket, avo, and labneh. There’s also a tantalising build-your-own-breakfast option, too. If you’ve just popped in for a beverage refreshment, neither the super smoothies menu nor the damn fine house blend coffee from Brisbane’s Q Roasters will disappoint. Sit inside and soak up the vibrant sun drenched atmosphere or grab a seat outside and admire the picturesque Tamborine Mountain views. Popping up recently as part of the newly built Australia Fair Metro precinct, SoPo Dining Room prides itself on “reimagined comfort food” that makes the most of fresh and locally-produced ingredients. They ain’t whistling dixie either, with the choice of three special banquet menus (one of which is a gluten-free option) with such flavoursome offerings as Spanish mussels with bacon and salsa verde, a smoked pork hock croquette, and a juicy lamb shoulder that comes with a delectable spiced pumpkin hummus. Going solo? Then the sticky Asian pork neck is the way to go or, if raw fish is your thing, you could do a lot worse than the ahi poke, which is tuna sashimi garnished with French shallot and tamari dressing with a fried wonton and pickled ginger and sesame mayonnaise. Mmmm. For years Southport felt a tad shy when it came to (sensibly) downing boutique beers, but recently they’ve been spilling out seemingly everywhere. SoPo is no exception with an beer list that includes refreshing propositions as Organic steam ale, an Enigma single hop and an Anytime IPA! Check out the weekly specials menu and you’ll notice on TGI Fridays if you reserve a table for six or more you’re rewarded with tasty bites to have with those yummy beverages. Yep, the north has certainly gone up a notch or two! Another venue that makes good use of seemingly-all-the-rage-at-the-moment rusting corrugated iron, this newly restored century-old Upper Coomera rustic treasure, nestled close to the Coomera River on the Oxenford road to Tamborine, reaffirms the allure of northern Gold Coast. While Pickers & Co. is promoted as an event hire venue where you can take full advantage of its olde-worlde character, you can still pop in for a locally-roasted coffee or cold refreshment while feasting on a sweet something. Choose your seat outside on their spacious decking area or inside amongst some interesting hanging lights and chandeliers. You can also have a browse through an array of clothes, trinkets, and homeware items that are available for sale, too. After their first successful event, Pickers & Co. will also be hosting food truck nights on occasion, so jump onto their Facebook page for updates. There’s plenty to admire at this funky but tucked away suburban bistro in Oxenford. From its reformed shabby chic corrugated iron bar and open-plan kitchen, to its welcoming “you feel like someone special” service. But it’s Black Sheep Bistro‘s swanky menu that impresses most. Now, lookie here, there’s a bistro breakfast menu that includes the alluring likes of “Franks ‘n’ Beans” (spiced pepernata beans with kranski, black pudding, bratwurst, fried eggs, and ciabatta), and a new spin on that forgotten could-be-a-good-hangover-cure staple “Bubble ‘n’ Squeak” (mashed up potato and vegetable hash with bacon, fried eggs, and toast). The lunch is just as eye-catching with a pulled pork shoulder burger, eggplant caponata and penne pasta and a Porterhouse steak amongst the oh-my-god-I’m-drooling highlights. There are “nibbles” from 11am while dinner is served on Friday and Saturday evenings. Get this: they’re fully licensed as well so you can break open the Burleigh Brewing beers, nip on a Nepoleone cider or mull over a glass or two of red or white wine. Heck, you’re even allowed to bring your own wine—BYO baby! We already talked up this gem a while back, but this ballsy bistro is too good a prospect not to mention again in a broader northern Gold Coast context. 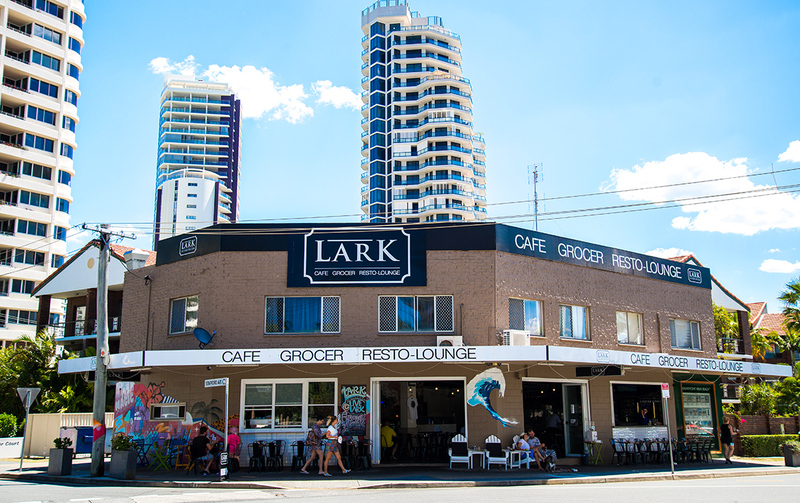 Just to recap the essentials about Main Beach’s Lark Cafe: during the week it’s all about the spacious, laidback ambiance, while over the weekend it’s about feasting on pizzas with quirky names, glugging down boutique beers, and listening to some live acoustic tunes. Yes, now you remember! Undoubtedly one of the coolest joints in Sanctuary Cove, this bar restaurant that overlooks the marina is the place to wine and dine in the north. We’ve always been a fan of the Black Angus hot rock concept, where your steak is served on a hot volcanic stone surface that slow cooks at your table as you eat. So when it comes to offering open-air sophistication with a stylish twist, it’s hard to better this splendid haunt. Want to read about more gems in the northern end? Check out more goodness here and here.